When Nissan introduced the 240SX in the fall of 1988, some said the spiritual successor of the original 240Z had returned. Enthusiasts were again treated to a car featuring a solid rear-wheel-drive chassis and enough torque to make most tugboat owners jealous. More important, this unique combination was wrapped in a slickly styled package that stood head and shoulders above the squared-off 200SX model it replaced. Unfortunately, a small but vocal group loudly complained that the 240SX wasn’t all it could be. Sure, it would have been nice to get the mega-boosted turbocharged engine available in other markets, but in defense of Nissan, such a package would have proved difficult to market in the United States, which generally favors torque over turbo lag. Instead, Nissan aimed the 240SX at the burgeoning sport-coupe market, which was poised for takeoff. Led by the Ford Probe, Toyota Celica and Acura Integra, as well as the Diamond Star triplets—Mitsubishi Eclipse, Eagle Talon and Plymouth Laser—sport coupes were making a comeback at the beginning of the 1990s. After years of small GTI-like hatchbacks dominating the scene, buyers seemed ready for something slightly larger and more refined. The 240SX fit in nicely, carving out a niche because it was the only rear-drive car in the group. It was styled a bit less aggressively than some of the others, and it seemed to cater to a more mature or refined driver, someone less interested in body kits and power bulges. The lack of aggressive styling doesn’t mean the 240SX is a slouch when it comes to tackling a twisty mountain road or weaving through the cones at a local autocross. Thanks to the good weight distribution and sporty suspension tuning afforded by the rear-drive layout, the 240SX spoils its owners with a sense of agility and stability. The car’s 2.4-liter engine shouldn’t be looked down upon, either, because it provides significant low- and mid-range torque, perfect for clawing out of tight corners or overtaking slower traffic on two-lane country roads. The original S13-chassis 240SX was first available as a handsome fastback or notchback, with a convertible version appearing later. The hardtops offered rear seats capable of hauling kids or, for a short ride, even a limber adult. The convertible models—coupes whose tops were chopped upon arrival in the U.S.—retained the overall good looks of their siblings, but unfortunately, Nissan offered them only with an automatic transmission. This was the sole 240SX model available to U.S. consumers for the 1994 model year. Nissan updated the 240SX for the 1995 model year. Externally, the look was completely new and more up-to-date, with sharper edges and a clean profile. The new S14-chassis 240SX was also slightly larger than its predecessor, offering a longer wheelbase and wider track than the first-generation car. Sold only as a notchback coupe, the second-generation 240SX received a slight face-lift for the 1997 model year, including slanted, “shark-eye” headlamps and a slightly restyled nose. New taillights completed the look. This car carried the line until it was discontinued in the U.S. market after the 1998 model year. The earlier S13-chassis 240SX is more wedge-shaped on the outside, yet the car’s interior is softer and more “organic” than its successor. In a world of rounded sport coupes, the original 240SX stands out, thanks to a sharply pointed nose fitted with flip-up headlamps and two small nostrils. It’s styled in the same vein as the Porsche 944 and second-generation Mazda RX-7. 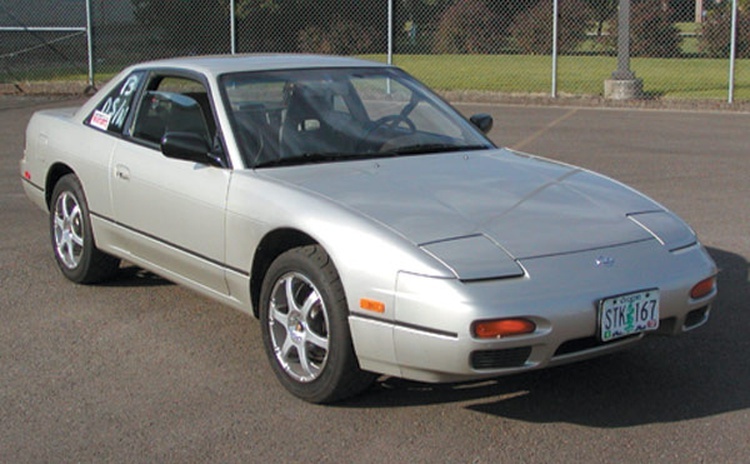 Introduced for the 1989 model year, the 240SX was offered with several trim grades. The fastback models feature a unique blacked-out treatment for the roof pillars, while the more upright notchback does away with this feature, giving the car a more formal roofline. High-end notchbacks received two-tone paint jobs, with the lower body moldings painted black. Pressed steel 15x6-inch wheels fitted with hubcaps were standard on the base-model 240SX. Nissan shod the 240SX’s upmarket SE and XE models with alloys. On early SEs and XEs these wheels have a 12-hole teardrop pattern reminiscent of early Volkswagen 16-valve alloy wheels, while later cars sport bright machine-finished seven-spoke wheels. All use a common 4x114.5mm bolt pattern, and the stock offset measures 40mm. For the performance minded, Nissan also offered a handling package for the 240SX. Cars equipped with the package were upgraded to “summer compound” Bridgestone RE-88 205/60R15 tires instead of the standard 195/60R15 Bridgestone SF-406s. Inside, S13 cars feature a molded dash fitted with a domed instrument pod behind a three-spoke steering wheel. Early S13 cars also have motorized shoulder belts, which run along the doorjamb. Front-seat occupants still had to buckle their lap belts, however. Another feature of early S13s is the car’s monoform seats, which have a smooth, one-piece molded look. Luckily for the enthusiast, their shape manages to keep their occupants in place, thanks to grippy side bolsters. The rear seat is also well bolstered, but its usefulness is hampered by the car’s low roofline, which makes occupying the rear seat uncomfortable for all but the most petite passengers. 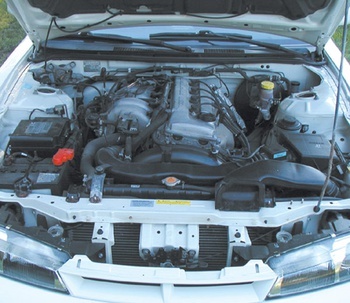 Underhood, early S13s can be identified by the engine’s cast-aluminum valve cover, which features thin ribs and “2400 12 Valve” lettering, signifying the car’s 2.4-liter, 12-valve, KA24E-spec engine. Later cars—1991 and on—use the 16-valve KA24DE engine and can be spotted by the smoothly surfaced rocker cover that incorporates centrally mounted spark plugs and a raised “Twin Cam 16 Valve” insignia. Weight for the early cars ranged from 2730 to 2747 pounds for five-speed hatchbacks, while the coupe came in at about 30 pounds lighter. The second-generation, S14-chassis Nissan 240SX is both wider and longer than its predecessor. The revised interior has a distinct ’90s flair to it, featuring a more sculpted dashboard. Nissan introduced the second-generation S14-chassis 240SX to the U.S. market for 1995, and this model was offered only as a notchback. 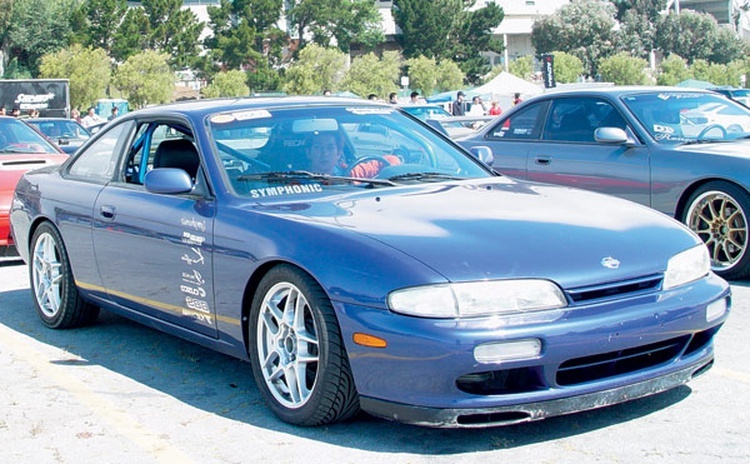 The S14, in addition to its longer wheelbase and wider track, sports a taller roofline. It weighs a bit more, too, from 2813 to 2826 pounds for five-speed models, depending on the trim level. The exterior of the S14 exudes a brawny, wide-shouldered feel that emphasizes the car’s long hood and rear-drive layout. Up front, flush-mounted lights, accentuating the car’s low nose, replaced the pop-up headlights of the S13. Base-model S14s retained the 15x6-inch steel wheels, plastic hubcaps and 4x114.5mm bolt pattern of the S13. Many base models also left the showroom floor with optional 15-inch aluminum wheels that incorporated a fat honeycomb pattern. On the SE model, Nissan upgraded the wheel and tire package to 16x6.5-inch alloy wheels with a clear five-spoke design, 5x114.5mm bolt pattern and Dunlop SP4000 205/55R16 tires. Inside, the S14 received a new dash with white-faced instruments. The three-spoke steering wheel now housed an air bag, which meant the motorized seat belts were no longer required. The truck-based 2.4-liter, 16-valve KA24DE engine pumps out 155 horsepower in stock trim. As we’ve noted, two different engines saw duty in the 240SX, the first being the 12-valve KA24E powerplant that was used for the 1989 and 1990 model years. The engine employed three valves per cylinder and generated 140 horsepower at 5600 rpm and 152 lb.-ft. of torque at 4400 rpm. This stump puller originally saw duty—without the free-flowing 12-valve head—in Nissan’s venerable Hardbody line of small pickups. The foundation of the KA24E is a robust cast-iron cylinder block and counterbalanced steel crankshaft riding in five large main bearings. A rigid one-piece girdle keeps the block stiff while reducing noise and vibration. Connecting rods are H-shaped and attach to cast pistons measuring 89mm in diameter. The stroke is a longish 96mm, giving the engine a total displacement of 2389cc. The cylinder head is cast of aluminum alloy and features a true cross-flow design, with the intake on the passenger side of the engine and the exhaust on the driver’s side. The compression ratio is set at a low 8.7:1, allowing owners to use 87-octane fuel without the risk of detonation. 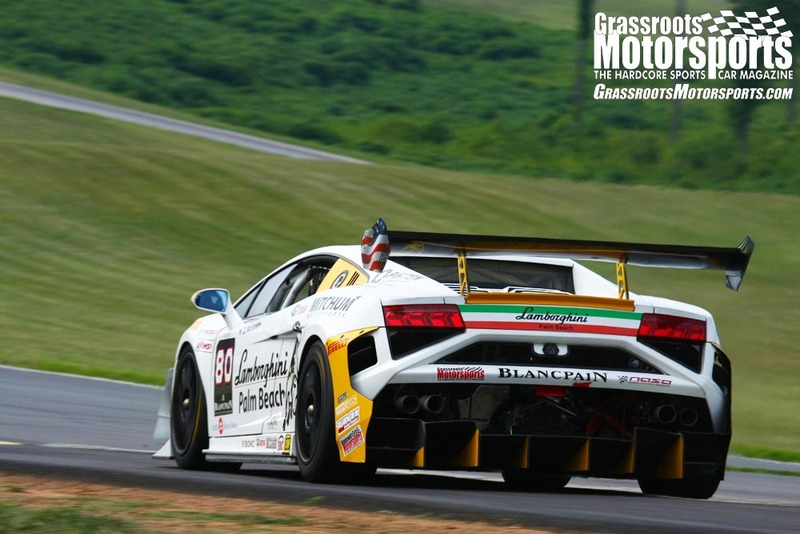 Two 34mm intake valves are used per cylinder, while one 40mm exhaust valve keeps velocities high at low rpm, boosting mid-range pulling power. The intake system is comprised of a cast aluminum inlet manifold featuring equal length runners with port-mounted fuel injectors. Nissan introduced the KA24DE engine for the 1991 model year. Horsepower climbed to 155, while torque was further improved to 160 lb.-ft. The basic block did not change, but the new cylinder head allowed for greater flow into and out of the engine. The dual overhead camshafts are chain driven and give the former truck engine a 6500-rpm rev limit. Both five-speed manual transmissions and four-speed automatics were offered on all models and years of the 240SX, except in 1994 when just the automatic convertible was available. The five-speed unit remained untouched throughout the production run and carries ratios set at 3.32:1 (first), 1.90:1 (second), 1.31:1 (third), 1.00:1 (fourth), and 0.76:1 (a tall overdrive fifth). The final drive is a short 4.08:1, meaning second tops out at an autocross-friendly 60 mph. Top speed is electronically limited to 120 mph. Stopping power for both the S13 and S14 chassis is provided by four-wheel disc brakes. At the front, vented rotors measure 9.9 inches in diameter and are grabbed by single-piston calipers. Solid rear brake rotors measure 10.2 inches in diameter and again are clamped by single-piston calipers. The 240SX’s steering is aided by a power-assisted rack-and-pinion box geared to provide a moderate 3.1 turns lock-to-lock, favoring in-town motoring over aggressive back-road driving. MacPherson struts are used up front, incorporating a linear-rate coil spring with a 102 lbs./in. spring rate for the S13 and a stiffer 120 lbs./in. spring rate for the S14. Lower control arms are mounted in large rubber bushings to help reduce noise and vibration. The S13 uses a 25mm diameter anti-roll bar up front, while the S14 chassis employs a 27mm front bar. Out back, a multi-link suspension featuring Chapman struts, three upper control links and a beefy lower control arm are all mounted to a rubber-isolated rear subframe. This complex system of links reduces camber change during hard cornering and introduces a touch of toe-in to help reduce the car’s tendency toward lift-throttle oversteer. A 16mm rear anti-roll bar was offered on all S13 models, but was only available on the SE version of the S14 chassis. In 1991, a sport-minded “handling package” became available on S13 fastback SE models and continued as an option throughout the S14’s life. The handling package includes four-channel ABS, a viscous limited-slip rear differential, stiffer springs and a 21mm rear anti-roll bar. When added to the S13-chassis car, the handling package also included Nissan’s Super HICAS four-wheel steering system. Super HICAS (High Capacity Actively Controlled Steering) changes the toe angle of the rear wheels by up to one degree, depending on the car’s speed: During low-speed maneuvers, the rear wheel angle is not altered; at medium speeds, the rear wheels turn in the opposite direction from the front wheels, helping to rotate the car from the rear. At higher speeds, where stability is important, the rear wheels turn in the same direction as the fronts, helping the car to smoothly make transitions (such as lane changes) with reduced effort. Most wheel manufacturers offer something for the 240SX. The 240SX may not enjoy as much aftermarket support as other compacts, but the cars still have plenty of potential. After spending most of the ’90s on the sidelines, the 240SX has recently been rediscovered by enthusiasts, thanks in part to the growing drifting scene and an increased awareness of the Japanese domestic market. Most enthusiasts will start the upgrade process with wheels and tires, and lots of choices are available because of the car’s 4x114.5mm and 5x114.5mm bolt patterns. While everything from lightweight 15 inchers to giant 18 inchers can be found, the most popular upgrades include 16x7.5-inch and 17x7.5-inch sizes. To make them fit, a 20 to 35mm offset is needed. There are countless choices of tires and sizes also, with 205/50R16, 205/55R16, 215/45R16 and 215/40R17 among the most popular. For owners prepping their car for the SCCA’s Street Touring categories—the STS and STX classes—there are several top manufacturers that offer 240SX-friendly sizes, including Falken’s Azenis Sport, Kumho’s new ECSTA MX and BFGoodrich’s g-Force T/A KD. For autocross and road-race fans wanting a bit more stick, there are several DOT-approved racing tires available in 15-, 16- and 17-inch sizes that will fit the 240SX. 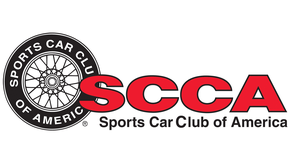 For SCCA Stock class autocross competition—where stock wheel diameter and width must be retained—the 205/50R15, 225/45R15 or 225/50R15 are the top choices for the S13 or base-model S14 chassis. S14 cars with the handling package can select from 205/55R16 or 225/50R16 tires. Kumho’s 205/45ZR16 ECSTA V700 or Hoosier’s new 215/40ZR16 will effectively lower the final drive ratio of the 240SX, and would make great choices for shorter courses. When running in Street Prepared, or even in the all-out Street Modified category, where changes in wheel width and diameter are allowed, 240SX owners have nearly unlimited choices. Wheels as wide as eight inches in the front and nine inches in the back can fit under the fenders of an S13, while even larger wheels can be shoehorned under the fenders of an S14. And given the allowance for fender flares in Street Prepared, a 240SX should never be in want of more tire. When it comes to suspension upgrades, there are countless choices for both the S13 and S14 chassis. Some of these options can be hard to find, however, as many are the Japanese domestic market (JDM) products that fill the shelves of overseas tuners. Choices from U.S. suppliers are more limited, but several companies have stepped up to the challenge recently and the situation has improved. As these cars are getting older by the day, a simple upgrade can begin with replacing the shock absorbers, dumping the original units for a set of nonadjustable performance struts such as the KYB GR2 or Tokico “blues.” If some adjustment is desired, KYB’s AGX is a popular and cost-effective upgrade for both S13s and S14s. More costly are JDM struts such as the Tokico HTS (similar to the Illumina) and GAB units. All three struts feature single-point adjustability, with combined compression and rebound damping. Another popular upgrade, especially for Stock class autocrossers, is the use of Koni’s re-valved inserts, which feature a fixed compression setting and adjustable rebound valving capable of supporting higher spring rates. Speaking of stiffer springs, manufacturers such as Eibach, Tein and Suspension Techniques offer performance springs that also lower the car. Eibach offers its Pro Kit, which lowers the car roughly 1.3 inches and features a progressive spring rate of 114 to 200 lbs./in. up front and 114 to 148 lbs./in. in the rear. Their Sportline kit lowers the car roughly 1.9 inches and features slightly stiffer rates. Tein offers both soft and medium spec springs—100 to 175 lbs./in. fronts and 100 to 162 lbs./in. rears—while Suspension Techniques offers a spring set that lowers the car roughly 1.3 inches and features linear spring rates of 206 lbs./in. up front and 155 lbs./in. out back. A 240SX owner considering coil-overs also has several choices. Ground Control offers a coil-over kit for the S13-spec KYB AGXs that allows for numerous choices in spring lengths and rates. Companies such as Tein, JIC-Magic and A’PEXi offer coil-overs that are easily available in the U.S., while makers such as Potenza, Buddy Club and Ikea Formula offer countless varieties of JDM products. Even Ohlins makes some remote-reservoir units for those with deep pockets. Larger anti-roll bars will go a long way toward reducing body roll during hard cornering, and adjustable units give greater flexibility in tuning a car’s handling behavior. Suspension Techniques and Whiteline both offer stiffer anti-roll bars with urethane mounting bushings for the 240SX. Another popular upgrade is to install urethane bushings in place of the stock rubber bushings, and just about every rubber bushing found under the car can be sourced in urethane or even spherical bearings. The most beneficial upgrade is to change the tension-compression rod bushings in the lower control arm, since the stock bushing is a silicone-filled unit that degrades over time, allowing the control arm to move around. Keeping the chassis stiff will go a long way toward improving the performance of a 240SX, especially one destined for autocross duty. This is best accomplished by installing a quality front strut tower bar. A rear strut tower bar is also a popular upgrade. 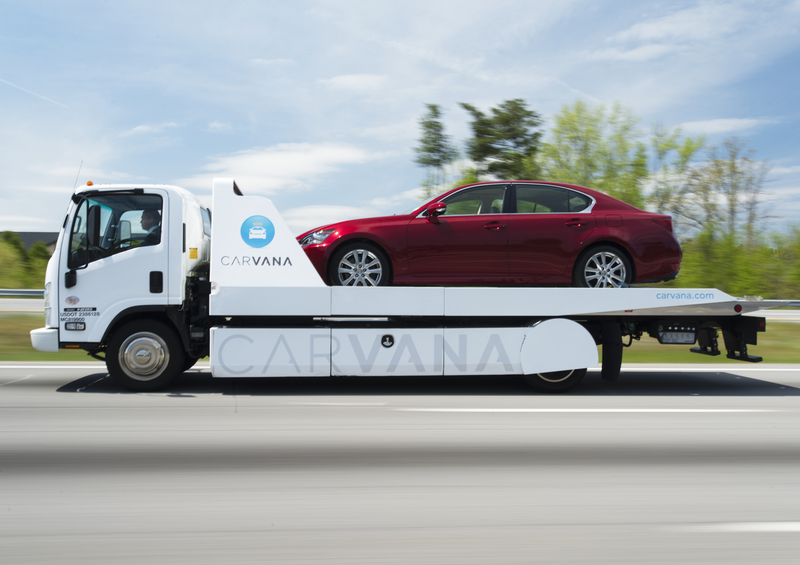 It helps to keep the independent rear suspension’s alignment from wallowing around during aggressive driving. Manufacturers such as Pilot and A’PEXi offer both front and rear bars, while several JDM offerings include trick carbon-fiber bars. These same companies are also beginning to offer numerous chassis stiffening bars that fit inside the rear footwell, trunk and even under the front subframe. Unless camber plates have been installed, camber is not adjustable up front on the 240SX. 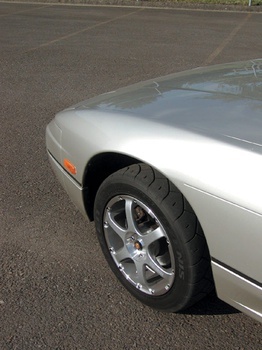 The rear camber is adjustable, however, and should be checked after a car is lowered. The overseas versions of the 240SX were available with Nissan’s turbocharged SR20DET engine. Signal Auto’s S13 features an SR20DET fitted with a huge intercooler. For 240SX owners seeking more power, there are numerous options for intakes, cams, headers, exhausts and even JDM-spec engine swaps. Since Nissan specified an already large throttle body for the 240SX, there isn’t much point in going any larger. A large-diameter exhaust system, on the other hand, will provide some gains in both useable torque and top-end pulling power. Many creative SX owners have been successful in having a local exhaust shop build a custom system using 2.5- or 2.75-inch diameter piping. You get what you pay for, though, so shop around and find a shop with quality construction techniques and a good reputation. Most off-the-shelf exhaust systems feature large 3-inch diameter piping suitable for Japanese-market turbo engines, but since the 240SX packs a meaty 2.4-liter engine, these systems don’t seem to hurt torque levels. The most popular is the A’PEXi N1, but of course, just about every JDM manufacturer makes an exhaust system. Several companies also offer exhaust headers for the KA24E and KA24DE engines. 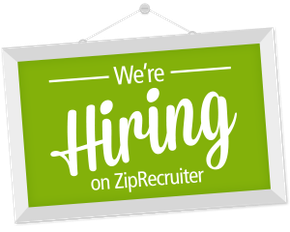 These include Hotshot, S&S, Pacesetter and Gude. GReddy offers a header for the KA24DE-equipped S14 chassis only. Each design is a little different in terms of power output and build quality, and most owners seem to believe the Hotshot header offers the best bang for the buck. Speaking of bang for the buck, one area where both the KA24E and KA24DE can pick up some performance is in the area of fuel management. Jim Wolf Technologies (JWT) offers a custom replacement ECU for the 240SX that has proved to gain upward of 10 horsepower at the rear wheels. JWT also offers a line of performance camshafts that produce similar results and really help to open up the top-end pulling power of the two engines. If a 240SX owner craves even more power, engine swaps and turbo kits are an option. 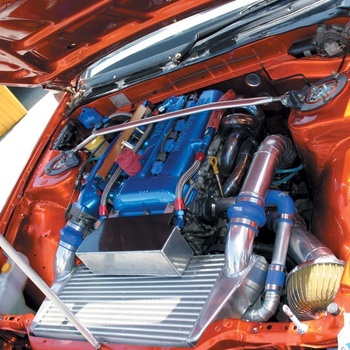 The ultimate power booster is to drop in the SR20DET-spec engine from Japanese-market cars. These engines deliver more than 200 horsepower in their stock configuration, and they can be modified to produce more than 300 horsepower reliably. That should prove sufficient for even the most power-hungry 240SX owner. The Nissan 240SX has always been a unique car, willing to take the high road against its techno-boosted, jelly-bean-shaped competitors. The same holds true today. A nicely turned out 240SX will draw admiration from true enthusiasts, who don’t get the opportunity to see such a creature every day. A true enthusiast was the sort of person who ended up buying a 240SX originally, whether off the showroom floor or used. Today, a 240SX owner is someone who appreciates the car’s precise handling, as with the S13, or its smoothly contoured body lines, as on the S14. 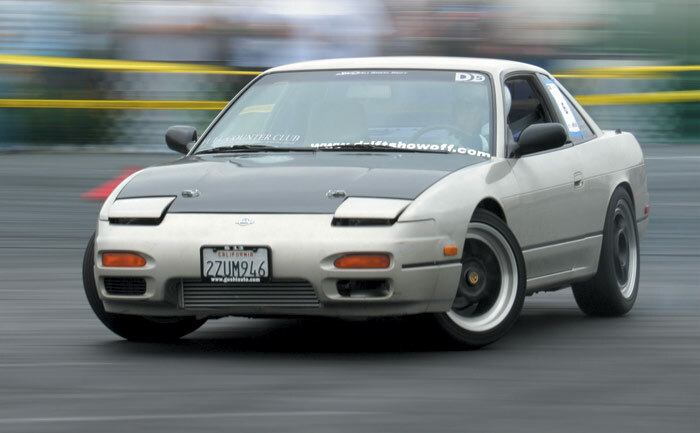 Enthusiasts tend to converge on similar ideas, which is why, when you see one Nissan 240SX at an autocross or track day, you usually see two or more. After all, great minds think alike.